ChicoryLane Farm offers a variety of natural environments, including several kinds of wetlands, forests, and grasslands. There are streams, vernal pools, a pond, and vistas both near and far. It also offers a variety of texture subjects, from old farm buildings to deeply furrowedd bark of enormous old trees. So, please join us to explore its photgraphic possibilities. 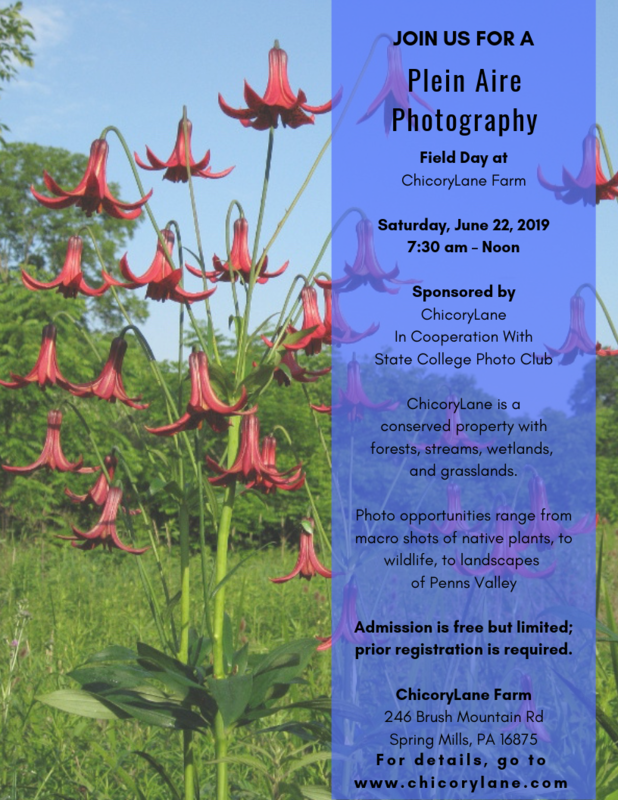 The field day will begin at 7:30 AM and will end around Noon, although individuals are invited to continue as they like until dusk. It will emphasize participation and self-selected activity. We encourage participants with a range of experience and expertise and the free-flow of information and perspective. Admission is free. But space is limited, so prior registration is required. You will be notified if space is available. The lane is 0.7 miles North of rt. 45 or ~2.5 miles South of rt. 192, just beynd Green Grove Rd. For additional information, get in touch with Deborah, James, or the Smiths.